Did you know that May is National Salad Month? Yeah, me either. I like it though. But, I deemed it tasty enough and began asking for salads for dinner. I didn’t venture too far away from the standard lettuce, carrots, tomato and cucumber versions for quite some time, but I was rather brave (for a picky kid) when it came to salad dressings. I quickly found that there wasn’t really a salad dressing I disliked. 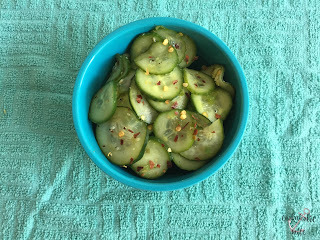 I believe I’ve mentioned this before, but as a kid, I ate a lot of cucumbers in the summer. My mom had two ways of preparing them – with vinegar, onions and a bit of sugar or with sour cream. It’s funny to say (write?) but it took a long time before it dawned on me that either of those dishes were considered a salad. Making a cucumber salad is still one of the first recipes I go to as soon as the weather starts to warm up. I’ve tried a ton of different varieties, but there is always room to try more, which I did this month by adding cilantro and lime. Cilantro Lime Cucumber Salad comes together in only a few minutes and is full of great flavor. 1. 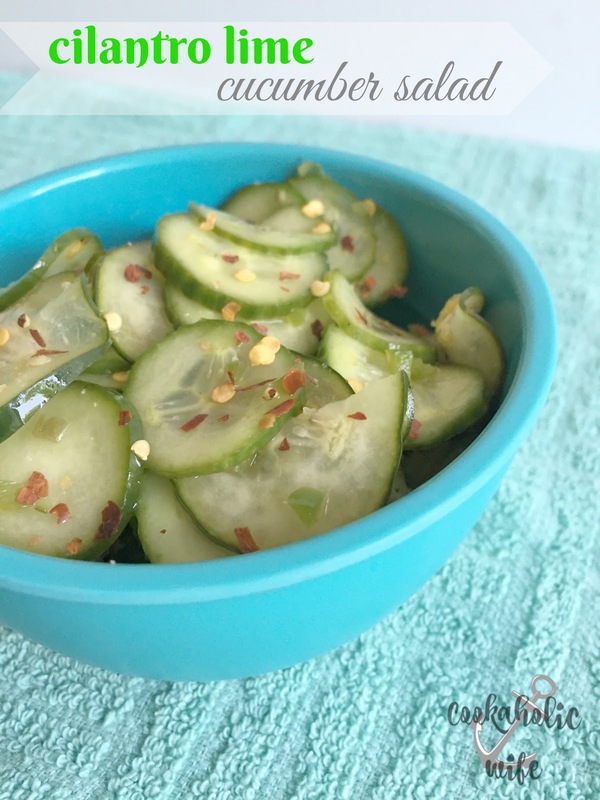 Combine all of the ingredients together in a bowl until cucumber slices are coated. 2. Refrigerate before serving to allow the flavors to enhance. *Fast Metabolism Diet: replace with 1/2 packet Stevia. 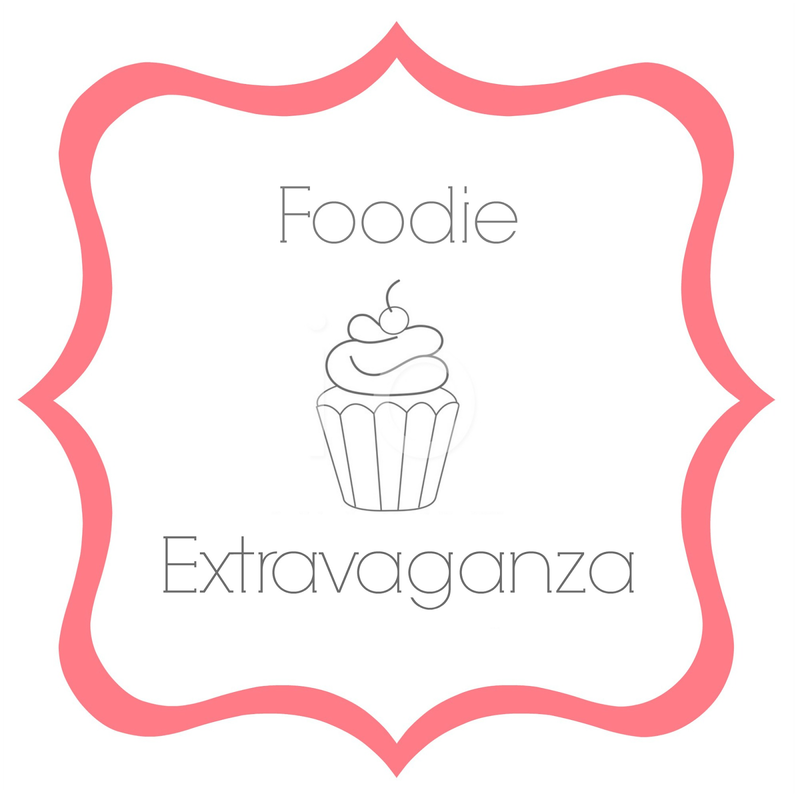 Posting day for #FoodieExtravaganza is always the first Wednesday of each month. If you are a blogger and would like to join our group and blog along with us, come join our Facebook page Foodie Extravaganza. We would love to have you! If you’re a spectator looking for delicious tid-bits check out our Foodie Extravaganza Pinterest Board! Looking for our previous parties? Check them out HERE. I have been trying to remember the first time I had a salad. Can't summon that memory. I love yours! And this salad looks great. Thanks for joining me, Nichole. We love cuke salads too Nichole. I love the addition of red pepper flakes and cilantro to this version. I love cucumber salads but this is so different and looks yummy! I love your story about your picky-eating beginnings. I have a few picky eaters, so here's hoping they develop their palates like you did! I would love to begin my meal with this tangy cucumber salad.